07 Nov Are you “Squatting” correctly? We have to be careful with hard and fast rules about squatting. The reason for this is that everybody has different hip and pelvic anatomy, and for this reason, everybody must squat a little differently. We will dive into the anatomy later in this post, but first, here are 3 tips to bullet proof your squat. The spine is able to transfer load much more effectively when the back is in a neutral position, i.e. the position that your spine is normally in when standing. Rounding the back while squatting can put too much load through your lower back and can result in injury. This may not occur instantly (although it can). Most back injuries occur gradually and may take weeks or even months of poor movement patterns to result in pain. Your knees should track along the line of your toes and not collapse inwards. This can lead to putting abnormal load on the knee joints and result in injury over time. Draw your hips backwards and stick your bottom out as if you were about to sit in a chair. The hip joint is what we call a ‘ball and socket’ joint. 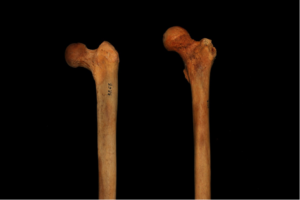 The top of the thigh bone, called the femur, makes up the ‘ball’ and the pelvic bone makes up the ‘socket’ component. 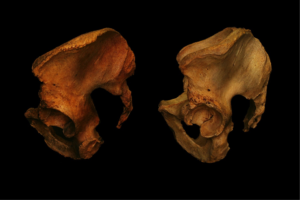 It is important to realise that everybody has different anatomy, and in the case of the hip joint, different people will have differences in the orientation of the ‘ball’ component of their joint. 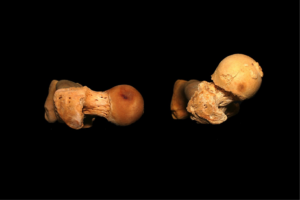 This can be seen below in a comparison of two different femur bones. Similarly, looking at the ‘socket’ component of the joint, above you can see the two sockets are facing in dramatically different directions. Again, these two people will not be able to squat in the same way. The best way to work out how wide your stance should be or whether you should have your feet turned out or facing forward is to experiment! Try narrow and wide stances and having your feet facing forward and turning out and see which feels more natural for you. If you need any help with bullet proofing your squat, or you think your squat technique may be impacting on an injury, make an appointment today!